When I began creating videos, I had a very limited application in mind. It wasn’t the case that I planned to flip the classroom. Instead, my motivation was that I found myself repeating certain basic concepts over and over again in office hours, and wanted to give students short videos (under ten minutes) explaining particularly hard-to-get concepts. After creating a few of these videos, I decided to have my students create videos explaining some basic problems. Seeing the myriad of different types of videos that my students produced really opened my eyes to the different possibilities. Here’s my breakdown of the most common ways to get started with videos, and the pros and cons of each. 1) The sage on the stage—now in video form! The simplest way to get started is to use that skill that all math lecturers have: stand in front of the board and record the lecture. This is probably the easiest way to get started, but isn’t an especially good way to create a short video. Drawbacks include that the speaker is often blocking the board, much of the time the material on the board cannot be read due to distance. It is also tempting in this format to include too much material, and not concentrate on the key ideas. Definitely this video is going to need some closeups to be able to read what’s going on! With a little more care, though, this format can be made much better. 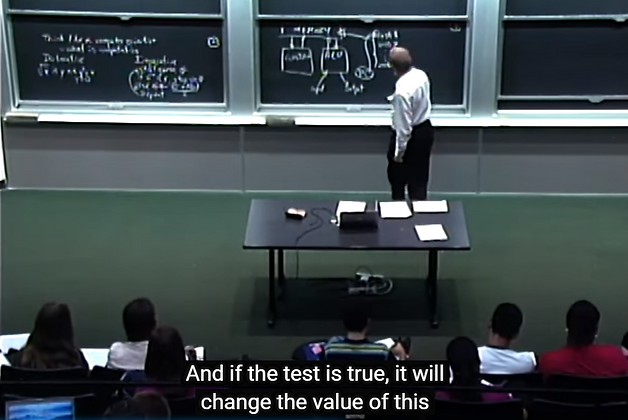 If a lecture is written specifically for the video, the cons can be greatly reduced, you can consider things like what the field of vision of the camera is, and how readable the text on the board is from different distances. You can also be much more careful in ensuring that the material on the board is easy to see. But what if you’re shy and/or modest? Or maybe you just hate the way you look on video (and believe me, everyone hates the way they look and sound on video the first time they see themselves)? The simplest solution technically is to just to shoot the video of a piece of paper that you are writing on. A more sophisticated approach is to use some sort of screen capture software together with a tablet. I actually think the paper approach comes out better here-emotion and nuance can be captured with finger and hand movements that just doesn’t across the same way with computer capture. Many of the early Khan Academy videos used this approach. A final approach is narrated Powerpoint or .pdf slides. Again this approach is somewhat weaker than a video of a problem worked out on paper, but still better than just posted slides with no verbal explanation and you might be able to reuse existing slides this way. Another alternative is to use presentation software. One of my personal favorites is PowToon (free to use with restrictions, subscription for unlimited use) found at www.powtoon.com. This software allows the user to drag and drop premade animations to create very fast paced, engaging presentations. The bad news is the time factor: it usually took me about an hour of effort for every minute of video that resulted. So save this for the short videos that really need it!